Get ready for a 35-faction royal rumble in the Warhammer universe. The mortal empires update is a massive free campaign update that will be available to owners of Total War: Warhammer and Total War: Warhammer 2. It will unite the factions and territories from both games into one colossal smash-up. I chatted to game director Ian Roxburgh and lead designer Jim Whitson to find out how it will all work. 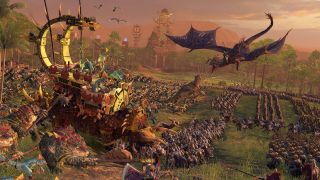 PC Gamer: How would you sum up the mortal empires update for Total War: Warhammer 2? Ian Roxburgh: Effectively it is the combination of the content from both Warhammer 1 and Warhammer 2 in one huge world. All of the races and a lot of the new features from Warhammer 2, including the universal territory capture, the ruins, searching the sea for treasure, all of these features and all of the new races and content put into one single massive mortal empires campaign map. We really are seeing the combinatin of the content from both the games in the biggest map we've done. It's this huge, huge sandbox campaign with about 35 different start positions, literally hundreds of hours of potential gameplay. The thing that we're particularly pleased about is that we're able to deliver this as part of the plan for the trilogy to our fans for free. It's the most hours of brand new gameplay that anyone would get out of a 'freeLC', so we're really pleased, and it's part of the ongoing plan of how we're going to realise all of this Warhammer content throughout the trilogy. Will it be a whole new map, or both maps connected together? Roxburgh: It's both areas of landmass, but we've changed them slightly for design reasons primarily, and a for technical reasons as well. There are way more regions and places to conquer than any of the maps we've done previously, but we've played around a bit with the landmasses to make the gameplay better and more refined, because this campaign really is more about these races from different parts of the world mingling and fighting against each other, so that you'd have the high elves fighting against the empire or the vampire counts or something. We've designed the new map to be optimal in terms of gameplay with such a massive vast area, so some areas will be slightly smaller than their equivalent on the vortex map. For gameplay reasons that's desirable for us. Think of the area that covers the old world, that's already very densely populated with lots and lots of content and DLC as well from the last year or so. We wanted to make sure that the new areas of map that we're adding into this whole world, such as the new world stuff—Lustria, the Southlands—has got that same intensity of gameplay and is designed to help you to mingle with races in other parts of the map as well. If Lustria was exactly the same as it was in the vortex then you'd still spend potentially hundreds of turns just fighting in that one area of the map. We've played around with it and adjusted it to maximise the design of the gameplay. If we threw too many new things in the end turn times would just become too long, so we're balancing up all these things and creating the perfect mix, in our eyes, of the gameplay and the design and all the content in there. How will objectives change in the new campaign? Jim Whitson: We don't have the vortex that we saw in Total War: Warhammer 2. Instead the races have got a wide variety of victory conditions that they're trying to meet, and they are tailored to suit the flavour of each of those races. Ian's mentioned the sheer wealth of content that we've got now with the content from both of the games and the DLCs and 'freeLCs', so one of those victory conditions for each of the races, instead of turtling in your starting position and really maxing out there and not really going out and experiencing the rest of this vast world one of the victory conditions actually forces you to go out into that world. Playing as Empire you'll have a victory condition that takes you to Lustria, another one that will take you to Ulthuan and so on. It's really about encouraging the player to experience the scale of the content that's available there. What sort of objectives will they have other than 'go to this part of the world', will you be fighting to capture a certain number of territories, anything more exotic? Whitson: There are 'capture certain number of territories', there are more exotic ones. The Chaos invasion that you saw in the first game, we've tweaked the gameplay for that, so that's present as well. There's a whole range of things, and as I say they're all tailored to each of the races. There may be objectives to capture a certain amount of settlements from each area of the map so that you can fine tune and just take out a capital of the enemy race to fulfill the victory condition, rather than just have 50 regions by the end of it or something. As Jim said there it's designed to encourage you to go out into the world and mingle with all those new races because that really is what this is about. We don't want people to sit on one small landmass and be able to win the game that way. With all those factions on one map, are you concerned about balancing between factions? Roxburgh: Yes, obviously we have to be concerned about that right from the beginning of the project, and to be honest we've been that way with Warhammer 1 and Warhammer 2 and it's no different with this. We have built new systems right from the beginning of this entire trilogy and dedicated more time on the project from the beginning to get this balance right. As you can imagine the nature of the asymmetry of the design of each of these races makes that even more complicated. We have internal systems here for testing and balancing. We get external feedback as well before release and we also feedback post-release and continually evolve and tweak as we release new DLC and new patches and stuff. This is part of a series of free updates that will stretch to the next game? There will be more 'freeLC' coming because it's something we really like to do. You saw the scale of Bretonnia at the end of Warhammer 1, and we'll continue to do that as much as we can. When we finally release Warhammer 3 you'll see the content from all three games combined in an even bigger mortal empires equivalent campaign. Part of the whole plan for this trilogy from the beginning was to do exactly this. Do you have any plans for more paid DLC for Total War: Warhammer 2 in terms of factions and other updates? Roxburgh: Yeah. We'll announce stuff officially in the future, but it's the same kind of blueprint for Warhammer 1. We'll be continually releasing some paid DLC to pad out the world, but people who don't buy that DLC will still see the benefit of it by seeing this new content coming into the game that they're playing already. Everybody will benefit from that for free anyway, but if people want to pay for certain bits to allow that new content to be playable then that's fine as well. It'll be the same kind of blueprint we applied to Warhammer 1. How do you decide what you're going to charge for and what you're going to add for free? Roxburgh: Well, it's a corporate decision as well. I mean, there's a lot of people involved in that so to be honest with you. From our development point of view the more we release free the better, but obviously at the same time we have to be able to generate revenue to keep making the new content for the future. It's about finding that balance, and it's not something that designers decide on their own, it's very much a company decision, so it has to work because we need to generate the revenue to make future content. At the same time, as I said, the amount of stuff we've been giving out for free as a result of this plan has been really gratifying for us and we hope everyone appreciates that. Games Workshop has moved on from the old world in their fiction and model ranges. How much to they still collaborate to maintain the old world's authenticity? Roxburgh: Right from the beginning we've had a really, really good working relationship. Because we've genuinely wanted to maintain the attitude we have with history from the beginning, which is: here's history and we want to recreate that accurately. We've taken that approach with Games Workshop's IP. We don't want to recreate or redesign any of the stuff you've done, what you've done is great, we want to take that and encapsulate that in a Total War format. We want to be true to the IP, we want to realise your IP in our game. There's never really been clashes or anything like that because we've all wanted the same thing. We've been able to do stuff possibly a bit more with things like Norsca because it's not the latest thing that Workshop are working on, but to be honest with you they've been more than happy for us to do the things we're doing and there's not really been any issues there. Whitson: I think the two franchsises are such a perfect match for each other that it makes that process easy. As designers we might have ideas for things that we'd like to do with the game but equally when you get down to reading those army books and so on there's so much stuff in there that immediately the ideas start coming out, and you're not straining to find stuff to put in the games that would go well in a Total War game because they are such a good match for each other. Is there an ETA for the update? Roxburgh: Er, soon! Sorry about that. Very imminently I can say. We want to make sure it's all completely balanced and fine tuned as best it can but it is very soon, so I'm sure you'll be playing it imminently. We're not talking months or so, we're talking faster than that.